NGC 1169: Photo of a barred spiral galaxy. NGC 1169, a spiral galaxy of surpassing beauty … one among hundreds of billions. Click to galactinate, and yes, you really want to. I know I just posted a really beautiful image of a spiral galaxy by Adam Block recently, but right after that he sent me another photo that got me thinking, and I figure that’s worth sharing. Also, who doesn’t want to start a new year with a gorgeous galaxy photo? And yeah, click that picture to get the whole high-res shot, because this is only a piece of it shrunk to fit the blog. That is NGC 1169, which is actually quite similar to the galaxy I posted last week. It’s a barred spiral with an inner ring, and majestic spiral arms, but it differs from the other galaxy because it doesn’t have that obvious outer ring and flocculent, fluffy spurs. Instead, the arms themselves are patchy. Can you see how the inner part of the galaxy is quite red, while the outer part is bluer? Apparently no stars have been born in the inner regions for quite some time; massive stars are blue, and don’t live long. Once they explode, it leaves behind redder and redder stars over time, so older galaxies (or older neighborhoods in galaxies) look red. The blue in the spiral arms means there’s been star birth there in the past few million years. It’s probably a slow, continuous process, like it is in our home galaxy, the Milky Way. You can also see patches of pink, where gas is excited by those stars. The arms are accented by dust as well, but it’s stretched out along with the arms. 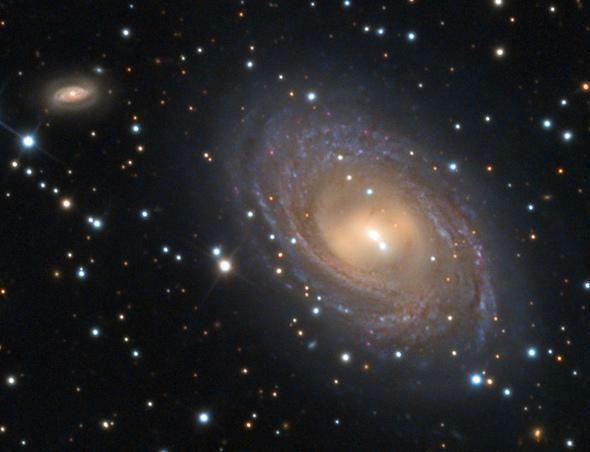 For all its beauty, I couldn’t find much info about this galaxy in the professional astronomical literature. Just one paper from 1994, discussing the distribution of gas in NGC 1169. Oddly, they drew the conclusion not much star formation was going on, or at least the density of gas in the galaxy wasn’t thick enough to sustain star birth except on a local level. Looking at Adam’s picture, I’m not so sure that’s true. NGC 1169 is about 85 million light-years away, a fair distance. It’s small in the sky, which may be why it hasn’t been well studied. I was surprised to see in the paper I found that the mass of the galaxy is very similar to that of the Milky Way, making it pretty hefty as galaxies go. It’s also roughly the same size as our galaxy, 100,000 light-years across or so. That gave me pause. I had certainly never heard of this galaxy before Adam sent me the note, and it looks like it’s not interesting (read: unusual) enough on its own to warrant much attention by the astronomical community. Yet it’s an entire galaxy. Hundreds of billions of stars, probably just as many planets, huge amounts of gas and dust distributed by the dance of gravity, angular momentum, and collisional dynamics—all that, and so much more … yet it’s literally undistinguished in our huge catalog of stellar cities. An entire galaxy like our Milky Way, essentially anonymous. I have difficulty wrapping my primitive monkey brain around the concept of a galaxy, physically understanding just how vast it is. Yet distances in the Universe are so great that this entire colossal structure can be reduced down to another grain of sand on the beach, one among hundreds of billions. It’s an astonishingly humbling experience. But, as always, I am not crushed by it, because I know that humans are amazing as well—because we can know about this galaxy. From across a black sea a billion trillion kilometers across we can gaze upon it, appreciate its beauty, and understand that there are so many others like it, including ours. The Universe is big, but then, we can be too.